Beaches not only provide great recreation for humans, but are also homes for many creatures. As a Shore Steward, it is important to learn how to enjoy the beach in a way that allows others to enjoy the sea’s bounty for generations to come. Biotoxins: Marine biotoxins, produced by phytoplankton, are extremely dangerous and are some of the most potent toxins in the world. Beach Etiquette & Beach Safety, brochure, WSU Island County Beach Watchers. Washington State Sport Fishing Rules, 142 pages, Washington Dept of Fish and Wildlife, 2014-2015. Small-scale Clam Farming for Pleasure and Profit in Washington, Derrick Toba, Bill Dewey, Teri King, 18 p, Washington Sea Grant, September 2005. Small-scale Oyster Farming for Pleasure and Profit in Washington, Derrick Toba, Tery Nosho, 16 p, Washington Sea Grant, November 2002. 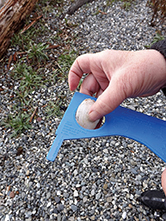 Hundreds of shoreline landowners around Puget Sound grow their own clams, oysters, and geoducks on their beaches, or mussels from their docks. Seed and equipment are sold by commercial shellfish growers and other organizations in our region a few times each year. Do not buy shellfish seed off the internet, and never buy shellfish at the grocery store to transplant on your beach. These practices are prohibited by both federal and state regulations. 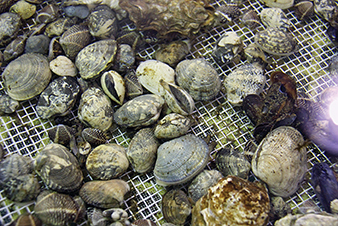 WDFW regulates the movement of shellfish to protect Washington waters from the spread of diseases and dangerous non-native pests like the Japanese Oyster Drill and the European Green Crab. When purchasing seed, make sure it comes from a pest and disease free area and is unrestricted for planting in all areas of our state. WDFW guidelines for importing and transferring shellfish in Washington State, can be found on the WDFW website. Other resources for purchasing and planting seed include the Pacific Shellfish Institute, Washington Sea Grant, and the Puget Sound Restoration Fund, which holds an annual seed sale on Bainbridge Island. Knowing where your septic system is located and following the maintenance and pumping recommendations as described in Guideline 1. Bagging your pet’s waste and putting it into the garbage. Managing your manure if you have livestock or horses. See Guideline 1. Minimizing the amount of pesticides and fertilizers you use. See Guideline 3. Planting trees, shrubs, flowers, and groundcovers to provide some filtration for stormwater runoff before it reaches your beach. See Guideline 3. Contaminants, including marine biotoxins, bacteria and viruses, can make you sick. Washing and cooking shellfish may kill some bacteria and viruses, but biotoxins and chemical contaminants are not removed by washing, cooking, or freezing. Shellfish safety also cannot be determined by the color of the shellfish or the water in the area. All areas harvested by commercial shellfish companies are tested and approved by WDOH to make sure water quality in the area is safe. However, WDOH does not regularly test private tidelands and beaches. If you live near a public beach with shellfish harvest, or a commercial shellfish operation, you may be able to infer if and when shellfish from your beach are safe to eat. But caution is always advised. Biotoxins, such as Paralytic Shellfish Poisoning (PSP or “red tide”), Amnesic Shellfish Poisoning, and Diarrhetic Shellfish Poisoning, are marine toxins that can concentrate in shellfish, and make them unsafe to eat. Biotoxins are commonly found in our marine waters and eating contaminated shellfish can result in severe illness or death. Other non-chemical contaminants that can be found in shellfish include the norovirus and vibrio. Illness from either of these can be avoided by thoroughly cooking shellfish. Avoid eating raw shellfish after periods of hot weather or stick to farmed shellfish (which are regularly monitored) from reputable shellfish companies. Once you have checked the regulations, purchased a license, bought your equipment (gauge, shovel for digging and 5 gallon bucket or other container for your shellfish), and made sure that there are no closures on your beach, you are ready go! Check the tide tables online, in newspapers, or in tide booklets, and plan to dig when the tide is low enough to access the beach. Only dig on your own beach or a beach open for public shellfish gathering. Dig carefully and try not to break or crush any shells with your shovel. Measure your catch to be sure it is legal. If any clams you dig are under the legal size, replace them in the harvest hole with the neck upwards, and cover them shallowly. When finished, fill in all your holes to protect shellfish and people. Wash your catch with clean salt water, cool your shellfish to keep them safe and fresh, and enjoy them using your favorite recipes! Harvest shellfish as soon as possible with the receding (outgoing) tide. Don’t harvest shellfish that have been exposed to the sun for more than one hour (less in really hot weather). Keep shellfish cold after harvesting. Anyone 15 years of age or over needs an annual license to harvest shellfish, such as clams and oysters, unless you are harvesting from your own private beach. You can be fined if you harvest shellfish over the allowable limit, or under the legal minimum size. 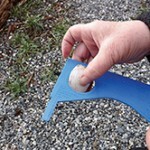 You can purchase an inexpensive plastic gauge at most sporting goods stores to measure your clams, shrimp and crabs. The Washington State Department of Health (WDOH) classifies recreational shellfish harvest beaches as to whether they are safe for gathering shellfish. They can be closed to harvest for a number of reasons, including pollution, harmful algal blooms, or biotoxins in the shellfish. The classifications are open, conditionally open, emergency closure, closed, and unclassified. Note that open classifications don’t always mean you can harvest. The Department of Fish and Wildlife (WDFW) sets limits and harvest seasons to prevent overharvesting. Check WDFW’s website to make sure you can legally harvest at the location you plan to harvest. Because harvest limits, seasons, and even shellfish consumption safety depends on the type of shellfish you harvest, knowing how to identify the different shellfish types is important. 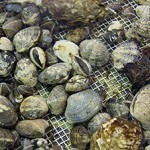 WDFW’s website also includes identification guides for common shellfish species in our region. Before you head out to clam, crab, fish, or collect seaweed for personal consumption, you must have the correct license with the appropriate catch cards. These are available at your local authorized license sales location, or directly from Washington Department of Fish and Wildlife fishhunt.dfw.wa.gov/ . There are different annual licenses for freshwater and saltwater fishing, shellfish/seaweed (which includes crab), combination fishing and shellfish, and razor clams. Be sure to also obtain your free copy of the “Fishing in Washington Sport Fishing Rules” pamphlet where you buy your license, or find it online. Walking carefully around tidepools and barnacle-covered rocks. Barnacles are living animals and your weight can crush them. Tidepools are important nurseries and safety zones for marine life, so stomping around in one—even if you don’t see anything—can also harm living things. Using wet and gentle hands. If you pick up any sea creatures, wet your hands in seawater before you touch or handle them. You have oils on your skin that are foreign and may be harmful to sea life. Lifting them from their home may cause stress or wreck their home, making it impossible for them to protect themselves or hide from predators. Don’t pry creatures off of rocks, as it may kill them. Replacing rocks. Looking under rocks and seaweed is part of the surprise and mystery of being at the beach. Be sure to lift rocks carefully, so you don’t crush anything underneath. Replace rocks exactly the way you found them, since many small organisms live under rocks and seaweed to protect themselves from air, sun, and predators. Leaving them uncovered destroys their home and possibly them, too. Leaving plants where you find them. Seaweed, eelgrass, and other plants in the water and on the beach provide erosion control, food, shelter, places to spawn and lay eggs, and protection from heat and cold. When walking on the beach, wading along the shoreline, or dragging your boat or kayak into the water, try not to disturb or squash plants. Protecting forage fish habitat. 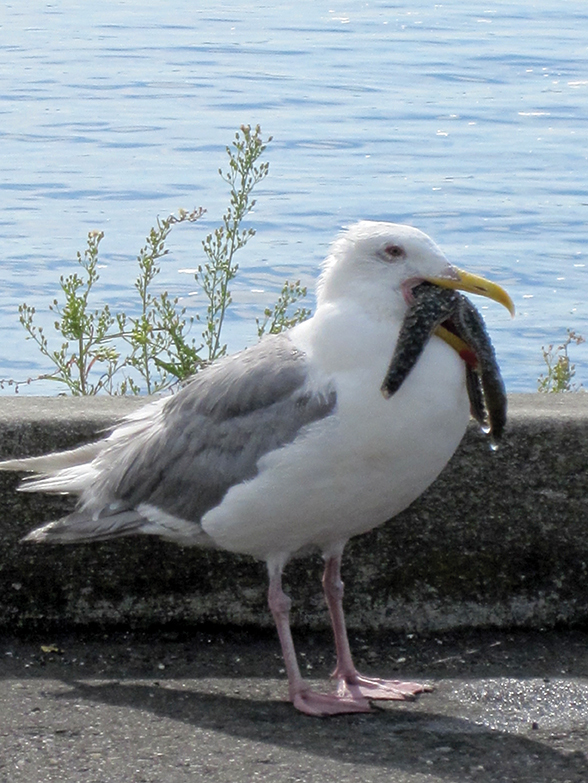 Forage fish are small fish like herring, sardines, and anchovies that provide food for other fish, birds, and marine mammals. They fill a critically important role in the food web and are important to the stability of salmon populations. 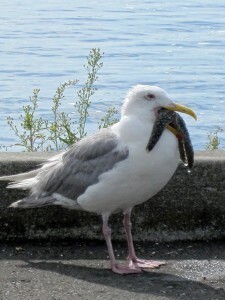 We have six kinds of forage fish and three depend on local beaches for their survival. Surf smelt and sand lance actually spawn and lay their eggs on the upper parts of the beach during the higher tides experienced at full moon. Pacific herring rely on eelgrass beds to spawn in. Learn more about protecting eelgrass in Guideline 7. Leaving seal pups alone. In the summer Harbor seal mothers usually give birth to one pup. She will leave the pup alone on the beach while she looks for food. She returns when she has finished her meal to nurse her pup with rich milk. While she is hunting, you may find the pup on the beach looking like it’s abandoned, looking at you with big, sad eyes and often crying for its mother with a sheep-like “ma-a-a”. If you find a seal pup, stay at least 100 yards away and make sure your dogs are leashed and do not harass the pup. The shy mother may not return to the beach if she sees people or dogs near her baby. She might be forced to nurse the pup at night if people are around during the day. If you think the pup is abandoned, a minimum observation period of 24 – 48 hours is recommended before contacting NOAA’s Marine Mammal Stranding Network (866-767-6114). Harbor seals and all marine mammals are protected from harassment by Federal law under the Marine Mammal Protection Act.